Not to be confused with Ketyconus. Keratoconus (KC) is a disorder of the eye which results in progressive thinning of the cornea. This may result in blurry vision, double vision, nearsightedness, astigmatism, and light sensitivity. Usually both eyes are affected. In more severe cases a scarring or a circle may be seen within the cornea. While the cause is unknown, it is believed to occur due to a combination of genetic, environmental, and hormonal factors. About seven percent of those affected have a family history of the condition. Proposed environmental factors include rubbing the eyes and allergies. The underlying mechanism involves changes of the cornea to a cone shape. Diagnosis is by examination with a slit lamp. Initially the condition can typically be corrected with glasses or soft contact lenses. As the disease worsens special contact lenses may be required. In most people the disease stabilizes after a few years without severe vision problems. In a small number of people scarring of the cornea occurs and a corneal transplantation is required. Keratoconus affects about 1 in 2,000 people. It occurs most commonly in late childhood to early adulthood. While it occurs in all populations it may be more frequent in certain ethnic groups such as those of Asian descent. The word is from the Greek kéras meaning cornea and the Latin cōnus meaning cone. Simulation of the multiple images seen by a person with keratoconus. People with early keratoconus typically notice a minor blurring of their vision and come to their clinician seeking corrective lenses for reading or driving. At early stages, the symptoms of keratoconus may be no different from those of any other refractive defect of the eye. As the disease progresses, vision deteriorates, sometimes rapidly. Visual acuity becomes impaired at all distances, and night vision is often poor. Some individuals have vision in one eye that is markedly worse than that in the other. The disease is often bilateral, though asymmetrical. Some develop photophobia (sensitivity to bright light), eye strain from squinting in order to read, or itching in the eye, but there is normally little or no sensation of pain. It may cause luminous objects to appear as cylindrical pipes with the same intensity at all points. The classic symptom of keratoconus is the perception of multiple "ghost" images, known as monocular polyopia. This effect is most clearly seen with a high contrast field, such as a point of light on a dark background. Instead of seeing just one point, a person with keratoconus sees many images of the point, spread out in a chaotic pattern. This pattern does not typically change from day to day, but over time, it often takes on new forms. People also commonly notice streaking and flaring distortion around light sources. Some even notice the images moving relative to one another in time with their heart beat. The predominant optical aberration of the eye in keratoconus is coma. The visual distortion experienced by the person comes from two sources, one being the irregular deformation of the surface of the cornea, and the other being scarring that occurs on its exposed highpoints. These factors act to form regions on the cornea that map an image to different locations on the retina. The effect can worsen in low light conditions, as the dark-adapted pupil dilates to expose more of the irregular surface of the cornea. Six genes have been found to be associated with the condition. These genes include BANP-ZNF469, COL4A4, FOXO1, FNDC3B, IMMP2L and RXRA-COL5A1. Others likely also exist. Despite considerable research, the cause of keratoconus remains unclear. Several sources suggest that keratoconus likely arises from a number of different factors: genetic, environmental or cellular, any of which may form the trigger for the onset of the disease. 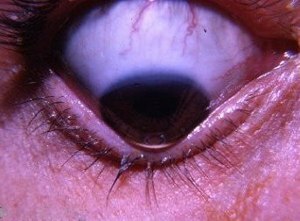 Once initiated, the disease normally develops by progressive dissolution of Bowman's layer, which lies between the corneal epithelium and stroma. As the two come into contact, cellular and structural changes in the cornea adversely affect its integrity and lead to the bulging and scarring characteristic of the disorder. Within any individual keratoconic cornea, regions of degenerative thinning coexisting with regions undergoing wound healing may be found. Scarring appears to be an aspect of the corneal degradation; however, a recent, large, multicenter study suggests abrasion by contact lenses may increase the likelihood of this finding by a factor over two. A number of studies have indicated keratoconic corneas show signs of increased activity by proteases, a class of enzymes that break some of the collagen cross-linkages in the stroma, with a simultaneous reduced expression of protease inhibitors. Other studies have suggested that reduced activity by the enzyme aldehyde dehydrogenase may be responsible for a build-up of free radicals and oxidising species in the cornea. Whatever the pathogenetical process, the damage caused by activity within the cornea likely results in a reduction in its thickness and biomechanical strength. At an ultrastructural level the weakening of the corneal tissue is associated with a disruption of the regular arrangement of the collagen layers and collagen fibril orientation. While keratoconus is considered a noninflammatory disorder, one study shows wearing rigid contact lenses by people leads to overexpression of proinflammatory cytokines, such as IL-6, TNF-alpha, ICAM-1, and VCAM-1 in the tear fluid. A genetic predisposition to keratoconus has been observed, with the disease running in certain families, and incidences reported of concordance in identical twins. The frequency of occurrence in close family members is not clearly defined, though it is known to be considerably higher than that in the general population, and studies have obtained estimates ranging between 6% and 19%. Two studies involving isolated, largely homogenetic communities have contrarily mapped putative gene locations to chromosomes 16q and 20q. Most genetic studies agree on an autosomal dominant model of inheritance. A rare, autosomal dominant form of severe keratoconus with anterior polar cataract is caused by a mutation in the seed region of mir-184, a microRNA that is highly expressed in the cornea and anterior lens. Keratoconus is diagnosed more often in people with Down's syndrome, though the reasons for this link have not yet been determined. Keratoconus has been associated with atopic diseases, which include asthma, allergies, and eczema, and it is not uncommon for several or all of these diseases to affect one person. Keratoconus is also associated with Alport syndrome, Down syndrome and Marfan syndrome. A number of studies suggest vigorous eye rubbing contributes to the progression of keratoconus, and people should be discouraged from the practice. Keratoconus differs from ectasia which is caused by LASIK eye surgery. Post-LASIK Ectasia has been associated with the excessive removal of the eye's stromal bed tissue during surgery. Prior to any physical examination, the diagnosis of keratoconus frequently begins with an ophthalmologist's or optometrist's assessment of the person's medical history, particularly the chief complaint and other visual symptoms, the presence of any history of ocular disease or injury which might affect vision, and the presence of any family history of ocular disease. An eye chart, such as a standard Snellen chart of progressively smaller letters, is then used to determine the person's visual acuity. The eye examination may proceed to measurement of the localized curvature of the cornea with a manual keratometer, with detection of irregular astigmatism suggesting a possibility of keratoconus. Severe cases can exceed the instrument's measuring ability. A further indication can be provided by retinoscopy, in which a light beam is focused on the person's retina and the reflection, or reflex, observed as the examiner tilts the light source back and forth. Keratoconus is amongst the ophthalmic conditions that exhibit a scissor reflex action of two bands moving toward and away from each other like the blades of a pair of scissors. If keratoconus is suspected, the ophthalmologist or optometrist will search for other characteristic findings of the disease by means of slit lamp examination of the cornea. An advanced case is usually readily apparent to the examiner, and can provide for an unambiguous diagnosis prior to more specialized testing. 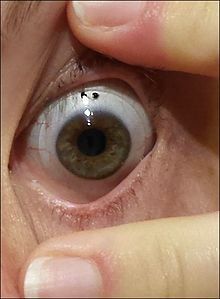 Under close examination, a ring of yellow-brown to olive-green pigmentation known as a Fleischer ring can be observed in around half of keratoconic eyes. The Fleischer ring, caused by deposition of the iron oxide hemosiderin within the corneal epithelium, is subtle and may not be readily detectable in all cases, but becomes more evident when viewed under a cobalt blue filter. Similarly, around 50% of subjects exhibit Vogt's striae, fine stress lines within the cornea caused by stretching and thinning. The striae temporarily disappear while slight pressure is applied to the eyeball. A highly pronounced cone can create a V-shaped indentation in the lower eyelid when the person's gaze is directed downwards, known as Munson's sign. Other clinical signs of keratoconus will normally have presented themselves long before Munson's sign becomes apparent, and so this finding, though a classic sign of the disease, tends not to be of primary diagnostic importance. A handheld keratoscope, sometimes known as "Placido's disk", can provide a simple noninvasive visualization of the surface of the cornea by projecting a series of concentric rings of light onto the cornea. A more definitive diagnosis can be obtained using corneal topography, in which an automated instrument projects the illuminated pattern onto the cornea and determines its topography from analysis of the digital image. The topographical map indicates any distortions or scarring in the cornea, with keratoconus revealed by a characteristic steepening of curvature which is usually below the centreline of the eye. The technique can record a snapshot of the degree and extent of the deformation as a benchmark for assessing its rate of progression. It is of particular value in detecting the disorder in its early stages when other signs have not yet presented. The corneal thickness from mild (> 506 μm) to advanced (< 446 μm). Increasing use of corneal topography has led to a decline in use of these terms. Stage is determined if one of the characteristics applies. Corneal thickness is the thinnest measured spot of the cornea. Traditionally, contact lenses for keratoconus have been the 'hard' or RGP variety, although manufacturers have also produced specialized 'soft' or hydrophilic lenses and, most recently, silicone hydrogel lenses. A soft lens has a tendency to conform to the conical shape of the cornea, thus diminishing its effect. To counter this, hybrid lenses have been developed which are hard in the centre and encompassed by a soft skirt. However, soft or earlier generation hybrid lenses did not prove effective for every person. Early generation lenses have been discontinued. The fourth generation of hybrid lens technology has improved, giving more people an option that combines the comfort of a soft lens with the visual acuity of an RGP lens. Scleral lenses are sometimes prescribed for cases of advanced or very irregular keratoconus; these lenses cover a greater proportion of the surface of the eye and hence can offer improved stability. Easier handling can find favor with people with reduced dexterity, such as the elderly. Some people find good vision correction and comfort with a "piggyback" lens combination, in which RGP lenses are worn over soft lenses, both providing a degree of vision correction. One form of piggyback lens makes use of a soft lens with a countersunk central area to accept the rigid lens. Fitting a piggyback lens combination requires experience on the part of the lens fitter, and tolerance on the part of the person with keratoconus. Between 11% and 27% of cases of keratoconus will progress to a point where vision correction is no longer possible, thinning of the cornea becomes excessive, or scarring as a result of contact lens wear causes problems of its own, and a corneal transplantation or penetrating keratoplasty becomes required. Keratoconus is the most common grounds for conducting a penetrating keratoplasty, generally accounting for around a quarter of such procedures. The corneal transplant surgeon trephines a lenticule of corneal tissue and then grafts the donor cornea to the existing eye tissue, usually using a combination of running and individual sutures. The cornea does not have a direct blood supply, so the donor tissue is not required to be blood type matched. Eye banks check the donor corneas for any disease or cellular irregularities. The acute recovery period can take four to six weeks, and full postoperative vision stabilization often takes a year or more, but most transplants are very stable in the long term. The National Keratoconus Foundation reports that penetrating keratoplasty has the most successful outcome of all transplant procedures, and when performed for keratoconus in an otherwise healthy eye, its success rate can be 95% or greater. The sutures used usually dissolve over a period of three to five years, but individual sutures can be removed during the healing process if they are causing irritation to the person. In the US, corneal transplants (also known as corneal grafts) for keratoconus are usually performed under sedation as outpatient surgery. In other countries, such as Australia and the UK, the operation is commonly performed with the person undergoing a general anaesthetic. All cases require a careful follow-up with an eye doctor (ophthalmologist or optometrist) for a number of years. Frequently, vision is greatly improved after the surgery, but even if the actual visual acuity does not improve, because the cornea is a more normal shape after the healing is completed, people can more easily be fitted with corrective lenses. Complications of corneal transplants are mostly related to vascularization of the corneal tissue and rejection of the donor cornea. Vision loss is very rare, though difficult-to-correct vision is possible. When rejection is severe, repeat transplants are often attempted, and are frequently successful. Keratoconus will not normally reoccur in the transplanted cornea; incidences of this have been observed, but are usually attributed to incomplete excision of the original cornea or inadequate screening of the donor tissue. The long-term outlook for corneal transplants performed for keratoconus is usually favorable once the initial healing period is completed and a few years have elapsed without problems. One way of reducing the risk of rejection is to use a technique called deep anterior lamellar keratoplasty (DALK). In a DALK graft, only the outermost epithelium and the main bulk of the cornea, the stroma, are replaced; the person's rearmost endothelium layer and the Descemet's membrane are left, giving some additional structural integrity to the postgraft cornea. Furthermore, it is possible to transplant freeze-dried donor tissue. The freeze-drying process ensures this tissue is dead, so there is no chance of rejection. Research from two trials in Iran provide low to moderate evidence that graft rejection is more likely to occur in penetrating keratoplasty than in DALK, though the likelihood for graft failure were similar with both procedures. Rarely, a nonpenetrating keratoplasty known as an epikeratophakia (or epikeratoplasty) may be performed in cases of keratoconus. The corneal epithelium is removed and a lenticule of donor cornea is grafted on top of it. The procedure requires a greater level of skill on the part of the surgeon, and is less frequently performed than a penetrating keratoplasty, as the outcome is generally less favorable. However, it may be seen as an option in a number of cases, particularly for young people. A possible surgical alternative to corneal transplant is the insertion of intrastromal corneal ring segments. A small incision is made in the periphery of the cornea and two thin arcs of polymethyl methacrylate are slid between the layers of the stroma on either side of the pupil before the incision is closed by a suture. The segments push out against the curvature of the cornea, flattening the peak of the cone and returning it to a more natural shape. The procedure offers the benefit of being reversible and even potentially exchangeable as it involves no removal of eye tissue. Corneal collagen cross-linking is a developing treatment which aims to strengthen the cornea, however, according to a 2015 Cochrane review, there is insufficient evidence to determine if it is useful in keratoconus. Radial keratotomy is a refractive surgery procedure where the surgeon makes a spoke-like pattern of incisions into the cornea to modify its shape. This early surgical option for myopia has been largely superseded by LASIK and other similar procedures. LASIK is absolutely contraindicated in keratoconus and other corneal thinning conditions as removal of corneal stromal tissue will further damage an already thin and weak cornea. For similar reasons, radial keratotomy has also generally not been used for people with keratoconus. Patients with keratoconus typically present initially with mild astigmatism and myopia, commonly at the onset of puberty, and are diagnosed by the late teenage years or early 20s. The disease can, however, present or progress at any age; in rare cases, keratoconus can present in children or not until later adulthood. A diagnosis of the disease at an early age may indicate a greater risk of severity in later life. Patients' vision will seem to fluctuate over a period of months, driving them to change lens prescriptions frequently, but as the condition worsens, contact lenses are required in the majority of cases. The course of the disorder can be quite variable, with some patients remaining stable for years or indefinitely, while others progress rapidly or experience occasional exacerbations over a long and otherwise steady course. Most commonly, keratoconus progresses for a period of 10 to 20 years before the course of the disease generally ceases in the third and fourth decades of life. In advanced cases, bulging of the cornea can result in a localized rupture of Descemet's membrane, an inner layer of the cornea. Aqueous humor from the eye's anterior chamber seeps into the cornea before Descemet's membrane reseals. The patient experiences pain and a sudden severe clouding of vision, with the cornea taking on a translucent milky-white appearance known as a corneal hydrops. Although disconcerting to the patient, the effect is normally temporary and after a period of six to eight weeks, the cornea usually returns to its former transparency. The recovery can be aided nonsurgically by bandaging with an osmotic saline solution. Although a hydrops usually causes increased scarring of the cornea, occasionally it will benefit a patient by creating a flatter cone, aiding the fitting of contact lenses. Corneal transplantation is not usually indicated during corneal hydrops. The National Eye Institute reports keratoconus is the most common corneal dystrophy in the United States, affecting about one in 2,000 Americans, but some reports place the figure as high as one in 500. The inconsistency may be due to variations in diagnostic criteria, with some cases of severe astigmatism interpreted as those of keratoconus, and vice versa. A long-term study found a mean incidence rate of 2.0 new cases per 100,000 population per year. Some studies have suggested a higher prevalence amongst females, or that people of South Asian ethnicity are 4.4 times as likely to suffer from keratoconus as Caucasians, and are also more likely to be affected with the condition earlier. Keratoconus is normally bilateral (affecting both eyes) although the distortion is usually asymmetric and is rarely completely identical in both corneas. Unilateral cases tend to be uncommon, and may in fact be very rare if a very mild condition in the better eye is simply below the limit of clinical detection. It is common for keratoconus to be diagnosed first in one eye and not until later in the other. As the condition then progresses in both eyes, the vision in the earlier-diagnosed eye will often remain poorer than that in its fellow. The German oculist Burchard Mauchart provided an early description in a 1748 doctoral dissertation of a case of keratoconus, which he called staphyloma diaphanum. However, it was not until 1854 that British physician John Nottingham (1801–1856) clearly described keratoconus and distinguished it from other ectasias of the cornea. Nottingham reported the cases of "conical cornea" that had come to his attention, and described several classic features of the disease, including polyopia, weakness of the cornea, and difficulty matching corrective lenses to the patient's vision. In 1859, British surgeon William Bowman used an ophthalmoscope (recently invented by Hermann von Helmholtz) to diagnose keratoconus, and described how to angle the instrument's mirror so as to best see the conical shape of the cornea. Bowman also attempted to restore vision by pulling on the iris with a fine hook inserted through the cornea and stretching the pupil into a vertical slit, like that of a cat. He reported that he had had a measure of success with the technique, restoring vision to an 18-year-old woman who had previously been unable to count fingers at a distance of 8 inches (20 cm). By 1869, when the pioneering Swiss ophthalmologist Johann Horner wrote a thesis entitled On the treatment of keratoconus, the disorder had acquired its current name. The treatment at that time, endorsed by the leading German ophthalmologist Albrecht von Graefe, was an attempt to physically reshape the cornea by chemical cauterization with a silver nitrate solution and application of a miosis-causing agent with a pressure dressing. In 1888, the treatment of keratoconus became one of the first practical applications of the then newly invented contact lens, when the French physician Eugène Kalt manufactured a glass scleral shell that improved vision by compressing the cornea into a more regular shape. Since the start of the 20th century, research on keratoconus has both improved understanding of the disease and greatly expanded the range of treatment options. The first successful corneal transplantation to treat keratoconus was done in 1936 by Ramon Castroviejo. According to the findings of the Collaborative Longitudinal Evaluation of Keratoconus (CLEK), people who have keratoconus could be expected to pay more than $25,000 over their lifetime post-diagnosis, with a standard deviation of $19,396. There is limited evidence on the costs of corneal cross-linking, a cost-effectiveness study estimated the costs of the total treatment for one person as £928 ($1,392 U.S.) in the UK National Health Service, but this may be as high as $2,500 per eye in other countries. A 2013 cost-benefit analysis by the Lewin Group for Eye Bank Association of America, estimated an average cost of $16,500 for each corneal transplant. Keratoglobus is a very rare condition that causes corneal thinning primarily at the margins, resulting in a spherical, slightly enlarged eye. It may be genetically related to keratoconus. Pellucid marginal degeneration causes thinning of a narrow (1–2 mm) band of the cornea, usually along the inferior corneal margin. It causes irregular astigmatism that, in the early stages of the disease can be corrected by spectacles. Differential diagnosis may be made by slit-lamp examination. Posterior keratoconus, a distinct disorder despite its similar name, is a rare abnormality, usually congenital, which causes a nonprogressive thinning of the inner surface of the cornea, while the curvature of the anterior surface remains normal. Usually only a single eye is affected. Post-LASIK ectasia is a complication of LASIK eye surgery. ^ "Keratoconus". NORD (National Organization for Rare Disorders). Archived from the original on 19 February 2017. ^ "Keratoconus" (PDF). The University of Texas Health Science Center at San Antonio. Archived (PDF) from the original on 8 September 2017. ^ a b c d e f g h i j k l m n o p q r s "Facts About the Cornea and Corneal Disease". NEI. May 2016. Archived from the original on 22 November 2016. Retrieved 5 November 2016. ^ a b c d Romero-Jiménez, Miguel; Santodomingo-Rubido, Jacinto; Wolffsohn, James S. (1 August 2010). "Keratoconus: a review". Contact Lens & Anterior Eye: The Journal of the British Contact Lens Association. 33 (4): 157–166, quiz 205. doi:10.1016/j.clae.2010.04.006. ISSN 1476-5411. PMID 20537579. ^ "Keratoconus Origin". dictionary.com. Archived from the original on 8 January 2016. Retrieved 2 November 2015. ^ a b Nottingham J. Practical observations on conical cornea: and on the short sight, and other defects of vision connected with it. London: J. Churchill, 1854. ^ a b c d Feder R, Kshettry P (2005). "Non-inflammatory Ectactic Disorders, Chapter 78". In Krachmer J (ed.). Cornea. Mosby. ISBN 978-0-323-02315-3. ^ a b c d e f g h i Epstein A (2000). "Keratoconus and related disorders" (PDF). North Shore Contact Lens. Retrieved 8 September 2007. ^ Nakagawa T; Maeda N; Kosaki R; et al. (June 2009). "Higher-order aberrations due to the posterior corneal surface in patients with keratoconus". Investigative Ophthalmology & Visual Science. 50 (6): 2660–5. doi:10.1167/iovs.08-2754. PMID 19029032. ^ a b Rong, SS; Ma, STU; Yu, XT; Ma, L; Chu, WK; Chan, TCY; Wang, YM; Young, AL; Pang, CP; Jhanji, V; Chen, LJ (4 July 2017). "Genetic associations for keratoconus: a systematic review and meta-analysis". Scientific Reports. 7 (1): 4620. doi:10.1038/s41598-017-04393-2. PMC 5496893. PMID 28676647. ^ a b c d e f g Caroline P, Andre M, Kinoshita B, Choo J. "Etiology, Diagnosis, and Management of Keratoconus: New Thoughts and New Understandings". Pacific University College of Optometry. Archived from the original on 7 January 2009. Retrieved 15 December 2008. ^ a b c d e f Arffa R (1997). Grayson's Diseases of the Cornea. Chap. 17. Mosby. pp. 452–454. ISBN 978-0-8151-3654-5. ^ a b c Brown D. National Keratoconus Foundation: Research Overview. http://www.nkcf.org Archived 22 March 2004 at the Wayback Machine. Accessed 12 February 2006. ^ Barr JT; Wilson BS; Gordon MO; et al. (January 2006). "Estimation of the incidence and factors predictive of corneal scarring in the Collaborative Longitudinal Evaluation of Keratoconus (CLEK) Study". Cornea. 25 (1): 16–25. doi:10.1097/01.ico.0000164831.87593.08. PMID 16331035. ^ "The Collaborative Longitudinal Evaluation of Keratoconus (CLEK) Study Archive". Archived from the original on 30 June 2007. ^ Spoerl E, Wollensak G, Seiler T (July 2004). "Increased resistance of crosslinked cornea against enzymatic digestion". Current Eye Research. 29 (1): 35–40. doi:10.1080/02713680490513182. PMID 15370365. ^ Gondhowiardjo TD; van Haeringen NJ; Völker-Dieben HJ; et al. (March 1993). "Analysis of corneal aldehyde dehydrogenase patterns in pathologic corneas". Cornea. 12 (2): 146–54. doi:10.1097/00003226-199303000-00010. PMID 8500322. ^ Daxer A, Fratzl P (1997). "Collagen fibril orientation in the human corneal stroma and its implications in keratoconus". Invest Ophthalmol Vis Sci. 38: 121–129. ^ Lema I, Durán JA, Ruiz C, Díez-Feijoo E, Acera A, Merayo J (August 2008). "Inflammatory response to contact lenses in patients with keratoconus compared with myopic subjects". Cornea. 27 (7): 758–63. doi:10.1097/ICO.0b013e31816a3591. PMID 18650659. ^ Edwards M, McGhee CN, Dean S (December 2001). "The genetics of keratoconus". Clinical & Experimental Ophthalmology. 29 (6): 345–51. doi:10.1046/j.1442-9071.2001.d01-16.x. PMID 11778802. ^ Zadnik K; Barr JT; Edrington TB; et al. (December 1998). "Baseline findings in the Collaborative Longitudinal Evaluation of Keratoconus (CLEK) Study". Investigative Ophthalmology & Visual Science. 39 (13): 2537–46. PMID 9856763. Archived from the original on 3 October 2016. ^ a b c Rabonitz Y (2004). "Ectatic Disorders of the Cornea". In Foster C; et al. (eds.). The Cornea (4th ed.). Philadelphia: Lippincott Williams & Wilkins. pp. 889–911. ISBN 978-0-7817-4206-1. ^ a b Merin S (2005). Inherited Eye Disorders: Diagnosis and Management. Boca Raton: Taylor & Francis. ISBN 978-1-57444-839-9. ^ Hughes AE, Bradley DT, Campbell M, Lechner J, Dash DP, Simpson DA, Willoughby CE (2011). "Mutation Altering the miR-184 Seed Region Causes Familial Keratoconus with Cataract". The American Journal of Human Genetics. 89 (5): 628–33. doi:10.1016/j.ajhg.2011.09.014. PMC 3213395. PMID 21996275. Archived from the original on 8 November 2011. Retrieved 14 October 2011. ^ Rabinowitz YS (1998). "Keratoconus". Survey of Ophthalmology. 42 (4): 297–319. doi:10.1016/S0039-6257(97)00119-7. PMID 9493273. ^ a b Kumar, Vinay (2007). "Eye: Cornea, Degenerations and Dystrophies". Robbins Basic Pathology (8th ed.). Philadelphia: Saunders/Elsevier. ISBN 978-1-4160-2973-1. ^ Koenig SB (November 2008). "Bilateral recurrent self-induced keratoconus". Eye & Contact Lens. 34 (6): 343–4. doi:10.1097/ICL.0b013e31818c25eb. PMID 18997547. ^ McMonnies CW, Boneham GC (November 2003). "Keratoconus, allergy, itch, eye-rubbing and hand-dominance". Clinical & Experimental Optometry. 86 (6): 376–84. doi:10.1111/j.1444-0938.2003.tb03082.x. PMID 14632614. ^ Bawazeer AM, Hodge WG, Lorimer B (August 2000). "Atopy and keratoconus: a multivariate analysis". The British Journal of Ophthalmology. 84 (8): 834–6. doi:10.1136/bjo.84.8.834. PMC 1723585. PMID 10906086. ^ Jafri B, Lichter H, Stulting RD (August 2004). "Asymmetric keratoconus attributed to eye rubbing". Cornea. 23 (6): 560–4. doi:10.1097/01.ico.0000121711.58571.8d. PMID 15256993. ^ Ioannidis AS, Speedwell L, Nischal KK (February 2005). "Unilateral keratoconus in a child with chronic and persistent eye rubbing". American Journal of Ophthalmology. 139 (2): 356–7. doi:10.1016/j.ajo.2004.07.044. PMID 15734005. ^ Lindsay RG, Bruce AS, Gutteridge IF (July 2000). "Keratoconus associated with continual eye rubbing due to punctal agenesis". Cornea. 19 (4): 567–9. doi:10.1097/00003226-200007000-00034. PMID 10928781. ^ Nordan LT (1997). "Keratoconus: diagnosis and treatment". International Ophthalmology Clinics. 37 (1): 51–63. doi:10.1097/00004397-199703710-00005. PMID 9101345. ^ Zadnik K (1997). The ocular examination : measurements and findings. Philadelphia: W.B. Saunders. ISBN 978-0-7216-5209-2. ^ a b Edrington TB, Zadnik K, Barr JT (1995). "Keratoconus". Optometry Clinics. 4 (3): 65–73. PMID 7767020. ^ a b c d e f Krachmer JH, Feder RS, Belin MW (1984). "Keratoconus and related noninflammatory corneal thinning disorders". Survey of Ophthalmology. 28 (4): 293–322. doi:10.1016/0039-6257(84)90094-8. PMID 6230745. ^ Maguire LJ, Bourne WM (August 1989). "Corneal topography of early keratoconus". American Journal of Ophthalmology. 108 (2): 107–12. doi:10.1016/0002-9394(89)90001-9. PMID 2757091. ^ a b Gupta D. "Keratoconus: A clinical update" (PDF). Archived from the original (PDF) on 15 May 2006. Retrieved 26 March 2006. ^ Krumeich JH, Kezirian GM (April 2009). "Circular keratotomy to reduce astigmatism and improve vision in stage I and II keratoconus". J. Refract. Surg. 25 (4): 357–65. doi:10.3928/1081597x-20090401-07. PMID 19431926. ^ Krumeich JH, Daniel J (August 1997). "Lebend-Epikeratophakie und Tiefe Lamelläre Keratoplastik zur Stadiengerechten chirurgischen Behandlung des Keratokonus (KK) I-III" [Live epikeratophakia and deep lamellar keratoplasty for I-III stage-specific surgical treatment of keratoconus]. Klin. Monbl. Augenheilkd. (in German). 211 (2): 94–100. doi:10.1055/s-2008-1035103. PMID 9379645. ^ "Corneal Dystrophies (including Keratoconus)". Eye Info. RNIB. Archived from the original on 24 April 2014. Retrieved 20 January 2009. ^ Rubinstein MP, Sud S (1999). "The use of hybrid lenses in management of the irregular cornea". Contact Lens & Anterior Eye. 22 (3): 87–90. doi:10.1016/S1367-0484(99)80044-7. PMID 16303411. ^ "SoftPerm Hybrid Contact Lenses Discontinued". Archived from the original on 12 October 2010. ^ Davis Robert, Eiden Barry. Hybrid Contact Lens Management. Contact Lens Spectrum: "Archived copy". Archived from the original on 23 December 2010. Retrieved 12 October 2010. CS1 maint: Archived copy as title (link). ^ Pullum KW, Buckley RJ (November 1997). "A study of 530 patients referred for rigid gas permeable scleral contact lens assessment". Cornea. 16 (6): 612–22. doi:10.1097/00003226-199711000-00003. PMID 9395869. ^ Yeung K, Eghbali F, Weissman BA (September 1995). "Clinical experience with piggyback contact lens systems on keratoconic eyes". Journal of the American Optometric Association. 66 (9): 539–43. PMID 7490414. ^ Schirmbeck T, Paula JS, Martin LF, Crósio Filho H, Romão E (2005). "[Efficacy and low cost in keratoconus treatment with rigid gas-permeable contact lens]". Arquivos Brasileiros de Oftalmologia (in Portuguese). 68 (2): 219–22. doi:10.1590/S0004-27492005000200012. PMID 15905944. ^ a b Javadi MA; Motlagh BF; Jafarinasab MR; et al. (November 2005). "Outcomes of penetrating keratoplasty in keratoconus". Cornea. 24 (8): 941–6. doi:10.1097/01.ico.0000159730.45177.cd. PMID 16227837. ^ Al-Mezaine H, Wagoner MD (March 2006). "Repeat penetrating keratoplasty: indications, graft survival, and visual outcome". The British Journal of Ophthalmology. 90 (3): 324–7. doi:10.1136/bjo.2005.079624. PMC 1856933. PMID 16488955. ^ Rubinfeld RS, Traboulsi EI, Arentsen JJ, Eagle RC (June 1990). "Keratoconus after penetrating keratoplasty". Ophthalmic Surgery. 21 (6): 420–2. PMID 2381677. ^ a b Sugita, Juntaru (1997). "Advances in Corneal Research: Selected Transactions of the World Congress on the Cornea". IV: 163–166. ^ Wagoner MD, Smith SD, Rademaker WJ, Mahmood MA (2001). "Penetrating keratoplasty vs. epikeratoplasty for the surgical treatment of keratoconus". Journal of Refractive Surgery. 17 (2): 138–46. PMID 11310764. ^ a b Yanoff M, Duker J (2004). Ophthalmology (2nd ed.). Mosby. ISBN 978-0-323-01634-6. ^ Poulsen, DM; Kang, JJ (July 2015). "Recent advances in the treatment of corneal ectasia with intrastromal corneal ring segments". Current Opinion in Ophthalmology. 26 (4): 273–7. doi:10.1097/icu.0000000000000163. PMID 26058024. ^ Sykakis, E; Karim, R; Evans, JR; Bunce, C; Amissah-Arthur, KN; Patwary, S; McDonnell, PJ; Hamada, S (24 March 2015). "Corneal collagen cross-linking for treating keratoconus". The Cochrane Database of Systematic Reviews. 3 (3): CD010621. doi:10.1002/14651858.CD010621.pub2. PMID 25803325. ^ Jabbur NS, Stark WJ, Green WR (November 2001). "Corneal ectasia after laser-assisted in situ keratomileusis". Archives of Ophthalmology. 119 (11): 1714–6. doi:10.1001/archopht.119.11.1714. PMID 11709027. ^ Colin J, Velou S (February 2003). "Current surgical options for keratoconus". Journal of Cataract and Refractive Surgery. 29 (2): 379–86. doi:10.1016/S0886-3350(02)01968-5. PMID 12648653. ^ Bergmanson JP, Farmer EJ (1999). "A return to primitive practice? Radial keratotomy revisited". Contact Lens & Anterior Eye. 22 (1): 2–10. doi:10.1016/S1367-0484(99)80024-1. PMID 16303397. ^ Davis, L (1997). "Keratoconus: Current understanding of diagnosis and management". Clinical Eye and Vision Care. 9: 13–22. doi:10.1016/S0953-4431(96)00201-9. ^ a b Grewal S, Laibson PR, Cohen EJ, Rapuano CJ (1999). "Acute hydrops in the corneal ectasias: associated factors and outcomes". Transactions of the American Ophthalmological Society. 97: 187–98, discussion 198–203. PMC 1298260. PMID 10703124. ^ US National Eye Institute, Facts About The Cornea and Corneal Disease Keratoconus Archived 31 October 2005 at the Wayback Machine. Accessed 12 February 2006. ^ a b c Kennedy RH, Bourne WM, Dyer JA (March 1986). "A 48-year clinical and epidemiologic study of keratoconus". American Journal of Ophthalmology. 101 (3): 267–73. doi:10.1016/0002-9394(86)90817-2. PMID 3513592. ^ Weissman BA, Yeung KK. Keratoconus. eMedicine: Keratoconus Archived 12 January 2006 at the Wayback Machine. Accessed 24 December 2011. ^ Fink BA; Wagner H; Steger-May K; et al. (September 2005). "Differences in keratoconus as a function of gender". American Journal of Ophthalmology. 140 (3): 459–68. doi:10.1016/j.ajo.2005.03.078. PMID 16083843. ^ Pearson AR, Soneji B, Sarvananthan N, Sandford-Smith JH (August 2000). "Does ethnic origin influence the incidence or severity of keratoconus?". Eye. 14 (4): 625–8. doi:10.1038/eye.2000.154. PMID 11040911. ^ Pearson RM (September 1989). "Kalt, keratoconus, and the contact lens". Optometry and Vision Science. 66 (9): 643–6. doi:10.1097/00006324-198909000-00011. PMID 2677884. ^ Castroviejo R (1948). "Keratoplasty for the Treatment of Keratoconus". Transactions of the American Ophthalmological Society. 46: 127–53. PMC 1312756. PMID 16693468. ^ Rebenitsch, Ronald L.; Kymes, Steven M.; Walline, Jeffrey J.; Gordon, Mae O. (May 2011). "The Lifetime Economic Burden of Keratoconus: A Decision Analysis Using a Markov Model". American Journal of Ophthalmology. 151 (5): 768–773.e2. doi:10.1016/j.ajo.2010.10.034. PMC 4714341. PMID 21310384. ^ Godefrooij, Daniel A.; van Geuns, Pepijn; de Wit, G. Ardine; Wisse, Robert P. L. (1 May 2016). "What Are the Costs of Corneal Cross-linking for the Treatment of Progressive Keratoconus?". Journal of Refractive Surgery. 32 (5): 355. doi:10.3928/1081597X-20160318-01. PMID 27163622. ^ Salmon, H A; Chalk, D; Stein, K; Frost, N A (28 August 2015). "Cost effectiveness of collagen crosslinking for progressive keratoconus in the UK NHS". Eye. 29 (11): 1504–1511. doi:10.1038/eye.2015.151. PMC 4645452. PMID 26315704. ^ Walker, Nicholas. "Corneal cross-linking patients need Medicare rebate". Optometry Australia. Archived from the original on 12 November 2016. ^ "Cost-Benefit Analysis of Corneal Transplant" (PDF). Restoresight.org. Archived (PDF) from the original on 5 March 2017. ^ Jinabhai, Amit; Radhakrishnan, Hema; O'Donnell, Clare (23 December 2010). "Pellucid corneal marginal degeneration: A review". Contact Lens & Anterior Eye. 34 (2): 56–63. doi:10.1016/j.clae.2010.11.007. PMID 21185225. Retrieved 9 July 2012. Wikimedia Commons has media related to Keratoconus.